Former Kalon Tripa Samdhong Rinpoche found that the recent Tibetan elections were too un-Tibetan and he didn’t feel right to be a part of it. He did not vote, saying the elections were fought in Western style, with cut-throat competition. And the use of the Dalai Lama’s name in the campaigns “was unthinkable for me”. On the issue of Tibetans taking citizenship of their host country, Rinpoche says that it is a purely personal choice, and this may not have a huge impact on the Tibetan movement in general. The only thing that will matter would be that the those who take citizenship might not remain “Tibetans” but would be Tibet supporters. 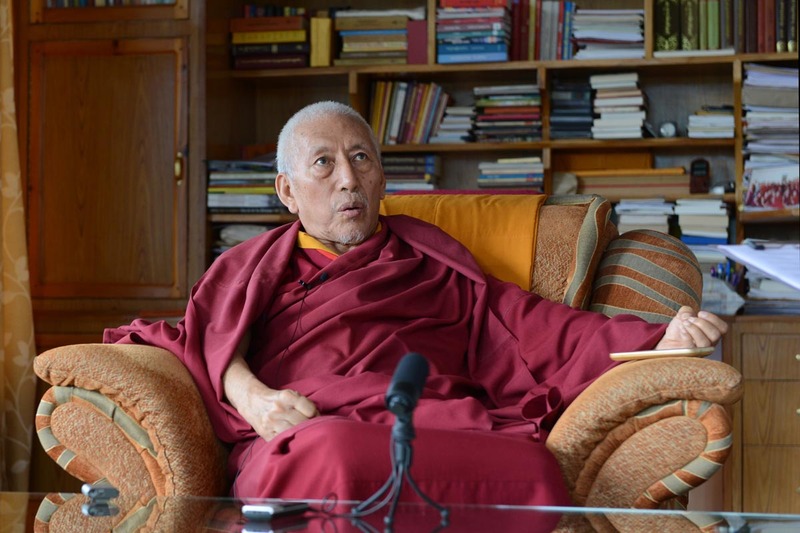 Interview with Samdhong Rinpoche on 19 august 2016. There are reports saying that you didn’t vote in the last Tibetan elections. Why not? That was an old story. It’s not important. As a citizen of Tibet, I had a responsibility to take part in the election of the leadership, and therefore I carry my voluntary tax book also, and I prepared. But during the course of the campaign, it was entirely different [from] what we thought in the beginning. Particularly what His Holiness — as a vision of Tibetan democracy — which was not one Western concept of democracy … His Holiness used to say “genuine democracy”. Genuine democracy means that the people must have the last word, and people should have the free will to choose their leadership. The system of the “campaign” is not in Tibetan culture. It is entirely Western, modern culture, saying that “I am the best, I must be elected!” Tibetan culture is “I cannot do, I am not very capable, the other is better,” something like that. Actually this is the difference between cooperation and competition. Tibetan culture is based on cooperation — not only Tibetan culture, the ancient cultures, are based on cooperation — and modern cultures are based on competition. Competition means one wins and the other loses. So in short, there are three things. The first thing as I mentioned, the Western style, competition, using the demerits of the other candidate. Of course they can differ on the policy matters, but they cannot disrespect the person. They can oppose the policy, but the individual person is equal, everybody is equal. And the most I was hurt by, was His Holiness’ name had been repeatedly used in the campaigns. That was unthinkable for me. Did you go to vote and not choose any candidate, or you didn’t go at all to vote, as there is a difference between the two. I did not go. I thought I would do it very quietly, I never had any intention to publicise it. Unfortunately a journalist friend of mine from Dharamshala, telephoned me, “where are you voting, I want to take photo.” I said I’m not in Dharamshala, I’m in south. And then he said, “are you taking part in the voting,” and I said, no. That small conversation he brought up and shared with many other journalists, and it came out. Otherwise I thought I would keep it to myself, not publicise it. So what changes do you suggest in the Tibetan election process? Actually at first, the rules of the election were very good. It is important to Tibetan culture, and also it was important to the genuine democracy way: ‘For the people, of the people, by the people’ as some of the Western people say. The truly democratic system: First choosing the candidate, by the people, with their free will, without indoctrination or brainwashing through campaign. And let them think freely, and let them propose the candidate. That is only in our system, there is not any other system like that. First they choose the candidate, and then you will know, most of the people, what kind of candidate it is, and you will know the people’s basic tendency. Then among them, the most voted people, three or four, then these can be chosen by the people. Then it is not a competition, but it is a choice, free choice. The people are not being indoctrinated, not being pressured, not using their emotion about their lineages or their relation, such as religion, or cholka [region], or religious tradition, not thinking about any of these things. Just about whosoever is the candidate. And then the final vote also, let the people choose. Not people being taught, you must choose this, you must not choose this. That is actually indoctrination, brainwashing. That deprives the people of their free will, free thinking. And apart from that, to exploit the emotion of people is very easy. You can say anything, and by that the vote can be carried away. So then it becomes ungenuine. So my wish is, just have a two-tier election. First candidate election as we do in the past, then thereafter the Election Commission chooses two, three, four — whatever they wish. And then let the people vote. The candidates if they withdraw, that is ok. If they do not withdraw, they can be asked by the Election Commission, if you are chosen, what would be your major policies. That should be asked by the Election Commission. In the past they do it, then the Election Commission can tell the people, this candidate has this stand on this policy. So therefore people should know, if I choose A, their foreign policy or economic policy or education policy would be like this, and if B, would be something different. This much knowledge people should have. Otherwise people should not be imposed upon by so many ideas, good or bad ideas. So by this way then whoever is chosen is genuine people’s will, not imposed people’s will. So this is my idea. So you are suggesting that the Election Commission should make the policies of the candidates known to the people. Yes. And the candidate must not contact the people. Nor people should have support or oppose before the election. They can support, they can oppose [by making their] vote. And otherwise the campaign system is arousing a lot of negative emotions in the mind of people, and that is cause of division of our unity. And that is most important particularly for a nation like us, in crisis. Like India, or like America, they can do, and they can compete or they can accuse each other, but after the election they forget, and their unity is always there. But we are a small community, and we are in exile. And therefore if our mind is divided, and we have some kind of unpleasant feelings with each other, that is very dangerous and very damaging to the cause of the Tibetan issue. After the last session of the 15th Parliament session, the Sikyong, Speaker, and members of Parliament consulted the two state oracles. How do you read the Nechung and Tsering Che-nga’s pronouncements and behaviours towards Sikyong and the Speaker? [Laughs] I don’t know, I was not there. I only read the predictions given by them. Tema [Tsering Che-nga] and Nechung are very much connected with His Holiness — right from the Gyalwa Gedhun Drup, the first Dalai Lama, till the 14th Dalai Lama. These two deities are the basic protectors, and also to serve, to help His Holiness’ works. Therefore, from the Fifth Dalai Lama, both of these have become also protectors of the Tibetan government, since the Dalai Lama was the head of government, and therefore, they were automatically a part of it. And during the election, the campaign process, His Holiness was quite sad about the way it was going on. And due to that unhappiness, His Holiness’ determination to live a long life also sometimes shattered, and was first noticed by these two deities, the oracles. And I think it is their duty to tell the people what is happening, because the people could not infer, could not know what His Holiness is thinking. And therefore the oracles told their experience to the people. And thereafter [the people] realised there is something wrong, and then [came ]the process of apologising and doing things better. So I think the two oracles have done their inevitable responsibility — what they should do, they have done. How relevant is it to consult oracles, considering that the leaders have been elected by the people? There is no connection between these two concepts. The oracles are when you are not able to decide something, reach some decision, by your own rational mind, because there are many things in the future, unknown. The oracles are considered to know all the three times, the past, the present, and the future. And therefore we consult them. And in the consultation, it is also our limitation, that sometimes we understood what they are saying, and sometimes we do not understand. In my life experience, consulting the oracles has never gone wrong. What they have told and we are able to do according to that, it was good. For example, His Holiness’ escape from Norbulingka in 1959. It was funny that the oracles were always saying that His Holiness should not go anywhere, he must stay in Norbulingka, Norbulingka is safe. But then on the morning of the 17th, they completely changed: You must go out this night, not a minute later. So that was a chance. If they say, His Holiness go out, it might get leaked out. This way, at many times — this is only one example — there are many times this kind of contradictory, sometimes, telling, later on realise that even in 1957 and 58, the Nechung Oracle has almost told clear that now there is not much hope. But you do this and you do that, and you do whatever His Holiness say, I will be able to make a bridge to cross the uncrossable river. So this kind of thing. Even elected people, to consult an oracle as to who should be the leader, that will be chosen. But the leader, when he or she is in doubt, they can consult them. It is said that some former kalons, including yourself as the Kalon Tripa, had a meeting with the Dalai Lama after the elections. Can you tell us a bit about that meeting? We were quite worried and we felt a sense of urgency. The oracles had given very drastic [messages] — even that His Holiness life was uncertain, this kind of prediction was there. And His Holiness is keeping distance from the Kashag [Tibetan cabinet] and other functionaries, and we can see the unhappiness of His Holiness. Although he did not tell, we can see. And at such a moment, we thought, His Holiness must be approached, to request, not to be annoyed with the people, and whatever they have done wrong they should be told, and they will correct their mistakes. And therefore we had an audience with His Holiness, and if he is not happy he must be giving pardon to whosoever have done the wrong. And we also approached the Chitue [exile parliament] and Kashag together: You must approach His Holiness and say sorry, and you must try to clarify whatever misunderstanding or whatever is [causing] His Holiness unhappiness, that should be removed. To remain like this at a distance is not good for the cause of the Tibetan people. So that was our mission: We asked His Holiness’ forgiveness, and His Holiness told us the reasons for his unhappiness, and then we went to the Kashag and Chitue, they must see His Holiness, and make things clear, should apologise. So this was, a kind of liaison between His Holiness and the people in the administration. And I think that helped a little bit, to bring closer. Then of course we are not alone — Gaden Tri Rinpoche, and all the abbots of the monasteries, many former government officials, have also written something like that. Many people have tried to make the gap narrow. And finally it had happened. What did the Dalai Lama say during that meeting? I do not remember. I think that is now in public domain I was told. Among the Kasurs [former ministers] and Tsoktso surpa [former Speakers], in the beginning we thought that whatever His Holiness told us, should be kept secret, should not be public. But they said no, the public should know. But then later on, the kasurs who were not in Dharamshala, who were living outside, have been informed through email, and that has been leaked now. So now everybody knows what His Holiness said. He said this throat-cutting competition, accusing each other, is not good, number one. And number two is, many statements are not based on truth, reality, there is a lot of untruth. Tibetan religious sects are represented in the Parliament. How relevant to you see this? What purpose do they serve? In 1959, the Tibetan government in Lhasa was so-called “dissolved” by the Chinese authorities. And then we refugees gathered together in December 1959, January 1960, about 6,000, 7,000 refugees, most of them were leaders of their respective groups, gathered in Bodh Gaya. And at that time, one thing, a very positive and unique thing happened, which was started in 1958, when the people of Chu Shi Gang Druk and Amdo offered His Holiness a long-life prayer and Kalachakra. At that time there was talk of the unity of all the Tibetan nations. Because at that time Tibetan nation was divided into many segments, and only the Drichu was considered to be the border between China and Tibet. More than 55% of Tibetans were [actually] outside of the Gaden Phodrang’s rule. And they are for a long time as a subject of China. But they are by race, by nation, by language, by dharma, they are all Tibetans. And the unity, coming together, of all the Tibetans were felt necessary, since 1958. And 1959 December and 1960 January, in Bodh Gaya, the congregation of people generally agreed that henceforth all the three cholkas will remain united, like the goal of iron, nobody can destroy it. And they have written it to His Holiness, giving this pledge to His Holiness. And since then, a unity of the three cholkas, was explicitly asserted by the people. And not only cholka, we also need the unity of the religious traditions. Although the four traditions belong to Buddhism, and the pre-Buddhist tradition are not much different from Buddhism, they are quite similar. The five religious traditions should also be united as one, not only in the religious affairs, but also in the social and political affairs. Our unity must be expressed through the unity of the all religious traditions and the unity of the three cholkas. That was the basic idea. And at that time, the Assembly of Tibetan People’s Deputies, now we call it the Tibetan Parliament-in-exile, was started. And at that time, in order to have unity, we have given representation equally to all. Otherwise, inside Tibet, and also in exile, the Cholka Sum, from a population viewpoint, they are not equal. Some have a large population, some have less population. Similarly the choe-lu (sects) are also, the population very vary, and not considering the population, only the cholka and choe-lu were given the most importance. And in order to exhibit that they are all equal, equal representation was given in the Assembly. And apart from that, how to represent people in the Parliament — we call in English, all segments of the people, all walks of life. Walks of life are divided by region, or culture, language, or, by religious affiliation, religious tradition. So, in order to make a unity of all religious traditions, and all cultures, and all regions, for this purpose we have the Assembly of People’s Deputies, elected by the people, are giving equal representation. So that to understand by ourselves, and to also show to the others, that we are all equal. The minorities and the majorities, the larger and smaller areas, we are all equal, and we are all working together. So this was the beginning of the Assembly. So since then, to represent all of life in the Parliament, the religious traditions would be also there. Because even today, the secularism is very popular all over the world, and particularly in the Western world. But you’ll find in the West, there are three or four countries, that have in their parliaments, representation of the Catholic, the Protestant, and other religious minorities. They also argue that it is also a segment of society, a segment of life. They have their own uniqueness and that should be represented in parliament. So therefore to make the religious traditions integrated, and to make the cholkhas integrated, the [Tibean] Parliament is making like that. And now you can debate whether it is necessary, or the representation of the Cholka Sum is sufficient to show the unity of the Tibetan people. It can be debated and it can be decided. But it is not against a democratic principle, and is not against a practising way of many democratic countries. And I do not see anything wrong for having religious traditions represented in the Parliament. Now your second part of the question, does this benefit the religious traditions, then I should say, very much doubt. Either there is benefit or there is harm, for the real religious practice. That is very much debatable. And otherwise, as to show the people’s unity, it is ok.
And the religious people, there are many different ways, particularly in the Buddhist countries, if you look at the Buddhist countries — today the countries who claim as the Buddhist countries there are only three: Myanmar, Siam (means Thailand), and Sri Lanka. And Sri Lanka does not say they are a Buddhist country: They say Buddhism is the officially organised religion. Thailand says they are a Buddhist country, Myanmar says they are a Buddhist country, constitutionally. In Burma and Thailand, the monks do not take any part in the political process, neither do they vote, nor do they stand for any post, so they are out of politics. Sri Lanka is like us, Sri Lanka monks can vote, and stand for political posts, and even they remain monk. So there is difference. In recent times, Bhutan is also a Buddhist country, and Bhutan’s constitution also says the monks and nuns are not participating in the voting system. Mongolia is also a Buddhist country, and they are now debating. At this moment Mongolian monks can become parliament members, and they can vote. So among the Buddhist countries, there are different ways of approaching it. In the future, when Tibet becomes more autonomous, we have our own kind of parliament, then, whether religious traditions should represent or not represent, that can be re-examined. But at this moment, I don’t see there is any demerit in it. Talking of equality in democracy, monks and nuns have two votes — for their sect and members for their cholka, whereas a layperson has only one vote to choose members for their cholka. Don’t you think this is undemocratic? This is debatable. ‘One man one vote’ is a general principle. But if you look at many democratic countries, they do have this kind of thing. I can give you an example, Punjab assembly, and similarly, some other states assembly, they have MLAs (members of the legislative assembly) elected by the graduates, and the graduates have an electoral college, and also whosoever is graduated from the university, they register their names in the graduated college, and they do vote for the MLA coming from the graduate college, and they also vote for their own constituency. And here also, one man can vote for two different people. Here also, ‘one man one vote’, is that one man can choose in a constituency, one representative can be chosen. My constituency one is Nyingma tradition, my other constituency is Dhotoe. Then I cannot put two votes for Dhotoe representation. I can put one vote for Dhotoe representation. And the other is a different constituency, it’s Nyingma tradition constituency, I can vote to one there. So if you vote once to one constituency, that is interpreted as ‘one man one vote’. Now, I don’t know, it is there. Otherwise, after independence, there are Anglo-Indian membership in the Parliament. They are a small society. They also do like this, vote twice, for different constituencies. And for different constituencies, the two votes do not invalidate the principle of ‘one man one vote’. Because of this ‘one man, one vote’ concept, more and more the younger-generation Tibetans are calling for either scrapping the sectarian representatives, or everybody be given the same opportunity, because we all pay the same amount of tax to CTA. What do you have to say about this? This debate has logic. I don’t say this debate is illogic. But it is for the people to decide. I have not a considered opinion about this. There are two different ways … one way, at this moment, among the Tibetan voters, I don’t think there is anyone who is declared as a non-believer, as not belonging to any of the religious traditions. Then one way is the religious representatives can be voted on by everyone, not only monks and nuns. This is one way. Or the other way is, the monks and nuns choose only their own religious representative, and they are not voting for the cholka representation, this is a different function. And the third option is to remain status quo. And maybe a fourth option with no religious representatives at all. Yes. That is also. But actually in the beginning when the adopted charter, the choe lu rime [secularism] was not there. And it was substituted by choe si sung del [having both religion and politics]. And since the charter, as the preamble, as choe si sung del, then religious representation is also … if someone argues the code, may say, unless you change this, there should be religious representation. So in the legal way there are so many arguments that can be put forward. What do you think about Tibetans getting Indian citizenship? According to Indian law, many Tibetans are Indian citizens by virtue of being born in India. And because of that some Tibetans have filed cases in court to exercise that right. To become any country’s citizen is an individual’s right, and nobody can stop that. And it is for the individual, whether he or she should retain Tibetan citizenship, or give it up and adopt the other country’s citizenship, that is all an individual’s right and nobody can encroach it. Nobody can say you must become an Indian citizen. That is also against democracy. But Indian citizenship, the people do not understand fully — when we were arriving in India as refugees in 1959, the Indian citizen law was the old one. From 1959 to 1987 — or 77 — i do not remember correctly — maybe 87 — The old law remained. And according to that old law, anyone born on Indian soil automatically becomes an Indian citizen. But that boy or girl, when they reach the age of 16, obtains an RC, Residential Certificate, then that boy or girl becomes a refugee, not an Indian citizen, because by his or her own choice, obtained that RC, that means, I am a foreigner, I am a refugee living here. So, who have obtained an RC, then he or she cannot say I am an Indian citizen because I was born here. Till 16 years of age, he or she was an Indian citizen. But when he or she takes the RC, then he or she becomes Tibetan refugee. That is the way. Of course he or she can return the RC, and I do not wish to remain a Tibetan refugee, since I was born here I must get back my Indian citizenship, that can be claimed. And a judge of a court will have to give that. And after 1987, the law was changed, then even if you were born in India you do not automatically become an Indian citizen, then you have to apply for Indian citizenship. Applying for Indian citizenship is a process. If any independent country, then their embassy shall have to recommend. For us, the Bureau of His Holiness the Dalai Lama in Delhi or the Kashag is authorised to issue ‘No objection certificate’ saying no objection to this person becoming an India citizen. Then he or she can obtain Indian citizenship. That is for everybody, whether born in India or not, or who have lived in India for a long time. There are a few conditions. But in the other countries, without taking citizenship, there are many limitations and difficulties. In India you can remain not an Indian citizen, it is not a problem. All the rights are equal. Even the Tibetan refugees, and descendants, can compete in Indian administrative services, or Indian foreign services, or Indian defence services, and they can do business, and they can purchase land and property — it differs from state to state, but you can get permission from the bank and the state. So therefore the need to become citizen is very limited. As a citizen or a non-citizen there’s not much different in freedom and rights are concerned. The Article 8(2) of the Charter of the exile Tibetans say that if out of necessity a Tibetan needs to take citizenship of another country, he or she could do that without having to give up the Tibetan citizen, provided he or she fulfils the conditions of Article 13, which is about the responsibilities of a Tibetan. That’s very true. I very much remember when that article was debated in the Parliament for a long time, and finally [was decided], if he fulfils the responsibilities of Article 13, he or she cannot be considered to be giving up the Tibetan citizenship. But that is 100% legal, if you go nation by nation. There are many nations that allow dual citizenship, and in that case our charter is ok. In India there is not a provision for dual citizenship. Only for non-resident Indians there is some provision, otherwise one person cannot hold two different citizenships. So it is our internal matter that we can take voluntary tax from them and we can give some benefits. Otherwise, according to Indian law, if it is disputed in a court of law, otherwise our charter can not stand. With regard to RC, there’s no choice given when someone turns 16 years of age. It is considered mandatory, and the RC is being issued automatically. That was negligence of our own, and negligence of the policy departments. Otherwise at that time, before the law was changed, you could very well say, I will not take it. But at that time, we must remember, then the refugee benefits will not be applicable. If you need to apply for land or any other thing that is given for Tibetan refugees, then you are not eligible. You are an Indian citizen. So you will not get a piece of land, or house, or free education in the schools. All this that is given to Tibetan refugees would have to be stopped. So therefore parents, and their children, and the Indian department, nobody has bothered. Of course they are all in the free schools. So if you say now, I’m not taking RC, that boy may be in class eight, nine, they can say, now you have to pay fees. Something like that. This is the technical problem. Would there be any ramifications toward the Tibetan freedom movement if Tibetans become citizens of other countries? There may not be huge or immense impact to the Tibetan movement. Also taking other citizenship, even there’s no provision for dual citizenship, they remain in their mind as Tibetans. In America and other countries, they will say, “Tibetan-Americans”, or something like that. One’s own race or nation is always combined with that. Then what the basic difference would be, is then the person can work as Tibet supporter, not as a Tibetan. As a Tibetan, I fight for my own rights. And Tibet support groups, I support the Tibetan people for fighting for their rights. So this will be the difference. Psychologically, there could be some ramifications, to work as a Tibetan, and as a Tibet supporter. But our Charter says you don’t have to give up your Tibetan citizenship if you take citizenship of another country. That is true. That is only in those countries in which dual citizenship is legal. Where dual citizenship is not legal, then our charter cannot overrule their constitution. Morally you may say “I am Tibetan”, but legally you are not a Tibetan. If you go to Chinese embassy to protest, and you are arrested and jailed, you will not be treated as Tibetan, you will be treated as American or Indian, something like that. Lobsang Tenzin, the 5th Samdhong Rinpoche, was prime minister (officially Kalon Tripa, or Chairman of the Cabinet) of the Central Tibetan Administration (Tibetan government-in-exile) based in Dharamshala, India from 2001 to 2011. He was born in Tibet on 5 November 1939, took vows at the age of six, and took his religious training at Drepung Monastery in Lhasa and at the Madhyamika School of Buddhism. In 1959 after the Chinese invasion of Tibet he was forced to go into exile in India along with the 14th Dalai Lama. There he worked in education and government, and is regarded as one of the leading Tibetan scholars of Buddhism. With all respect, I feel like Ven Samdhong Rinpoche la does not want us to move forward. It is the democratic right of every people to agree, disagree, and criticize any public figure in life. Neither I want to support Rinpoche nor he needs mine, but the fact of the matter is that he is undoubtedly a great scholar of Tibetan Buddhism and has given the best part of his life working in Tibetan society. I think we should be careful with our words while dealing with people of such high intellect and clean public records. Rinpoche is different from us in many ways as he always has the interest of Tibetan people in his heart and he did whatever he thought was right to his conscience. You should come to the field and lead us by good examples for couple of years before pointing accusing fingers at this great Rinpoche. Show us by good deeds like Rinpoche. With all due respect to Rinpoche, I would like to make the following points. 1. Rinpoche is in favour of status quo with regard to the Choelu representatives. Being traditionalist, he obviously will be for having Choelu representatives. But the majority of the youth today are calling for ending representatives from the religious sects. His argument of religious unity talked about in Bodh Gaya in 1959-60 is any way by then, not now. We don’t need religion mixed with politics any more. 2. Look at Rinpoche’s “one man one vote” concept. Totally skewed. Monks and nuns have an extra vote as they vote for Cholkha and Choelu, whereas lay people have right to vote for Cholkha representatives. So how does that become “one man one vote”. Let’s stop that extra voting right for monks and nuns by scrapping the Choelu representatives. 3. Rinpoche, having been the former Kalon Tripa (Prime Minister) is giving wrong information. Since when Tibetans holding RC could work in the Indian government? A few years ago even Tibetan nurses were not allowed to work in Indian hospitals. It’s absurd that a person of such caliber giving misinformation. After becoming citizens, then Tibetans could work in Indian government. 4. Another wrong information is regarding the dual citizenship issue. India does not recognize Tibetan as citizens of Tibet. Then how come Tibetans become holders of dual citizenship if they become Indian citizen. At the moment Tibetans who were born in India do not have any citizenship. If and when they become Indian citizens, that will be only one citizenship. So how does such Tibetans become Tibet supporters. It becomes obvious that Rinpoche is not favouring Tibetans taking Indian citizenship. And he’s trying to stop them from using such mind game with wrong information. Tibetan Charter clearly says that if a Tibetan takes/become citizenship of another country, he or she does not need to give up his/her Tibetanness (I use this word since there is no Tibetan citizenship). Thanks LW for these important questions. But the public need get the right information so that they would decide what’s are their rights and what’s good for them. Are we moving to real democracy “Mangtso” or égocracy “Rangtso”? In all the real Democracy, candidates are supposed to present themselves and their program. In politics you are not expected to play a drama of “altruism”, “compassion”, and low profile. Unless we are supposed to vote for a bodhisattva who can give up all the advantages of Samsara (Gigten korwa) which is the opposite of Politics. We should not underestimate the Tibetan people; they know exactly what’s good for them and for their country Tibet. Beware of the clever debater who can make white look black and black look white. He is good at mind game and word game. He also represents Tibetan orthodoxy. His greatest enemy would be an informed Tibetan public. His neo-conservative and appeasement policies have led our freedom struggle to nowhere, resulting in young people and many progressives disillusioned and ostracized by conservative members of Tibetan society for holding different views other than the mainstream establishment. Regarding religious representation in our Parliament, I find it amusing that even though the Dalai Lama consistently talks about secularism in recent years, the Tibetan Parliament pretends not hearing about it. If we adopt a secular constitution then the discussion of religious representation will die a natural death. The counter argument for this will be of course the Bodh Gaya promise for unity among religious and regional affiliation will be then not upheld. But the question will remain as to how amenable our democracy is to evolving and changing values and time. One false claim in Rinpoche’s statement is that Tibetans can join Indian government’s administrative or foreign service. I don’t think Tibetans can do that without becoming an Indian citizen. Finally, thanks LW for the interview and of course Rinpoche la. Thanks to asked such direct questions. Good questions. Was there any condition or pre-screening of the questions? I am curious about reasons for Rinpoche to give this interview. Does Rinpoche realise that it is the establishment candidates who invoked His Holiness’ name throughout this campaign and in fact, it was his own protege, Penpa Tsering, who “exposed” His Holiness as not being truthful on the matter of Kalachakra. Penpa Tsering placed His Holiness in this election when he refused to debate Lukar Jam. I am concerned with some rather dangerous views Rinpoche exhibits on democracy, election, and Indian citizenship. His views on election and removal of direct access to the candidates by the people is dangerous. He is advocating limiting debates and dialogues. Yes, democracy can be unpleasant and inconvenient but it allows people to form their own opinions based on information they receive. Rinpoche’s knowledge of Indian citizenship is not fact-based. The Delhi Court ruling on Indian citizenship (in the case of Lhagyari) determined that mere registration as a foreigner does not revoke one’s Indian citizenship. If his assertion that a Tibetan who adopts another citizenship ceases to become a Tibetan (CTA) citizen, is he aware that when he appointed Kasur Mrs Takla and Kasur Chope Paljor, he was appointing “non-Tibetans” to that post? This interview is revealing and I am concerned. Well done, nice question; it will help people who are in the dark still. Very Good Interview Lobsang Wangyal la. You have posed wonderful questions, very relevant and very important. With regard to Article 8 of the Charter, a Tibetan taking Indian citizenship will remain a Tibetan citizen as long as he fulfils the duty of a Tibetan citizen, like paying green book voluntary contribution etc. as proved in Article 13. But with regard to dual citizenship, no country recognises CTA or Tibet as independent country, so Tibetan as Citizen is not accepted by any country. So there is no question of dual citizenship. It is only a Tibetan national — and yes, if a Tibetan takes Indian citizenship, he remains a Tibetan Citizen under the Charter. Though he may not remain a refugee, he is still a Tibetan citizen, and Article 8 of the Charter does not speak of such provision of subjective dual citizenship. When the Charter specifically says that acquiring other citizenship will not forfeit your Tibetan citizenship, there is no question of losing the benefit of being a Tibetan citizen — i.e., free schooling and land and house etc. Although the land and houses were initially given to the Tibetan refugees and now devolved to their legal heirs. By choosing Indian citizenship, one may not remain a Tibetan refugee, but he remains a Tibetan citizen under the Charter, and the Charter provides duty on CTA to look after the welfare of the Tibetan citizens. Therefore, it needs debate and proper interpretation by the concerned authorities, especially by Tibetan Parliament and Tibetan Supreme Justice as law interpreter. Rinpoche is my respected teacher so it is not writing aginst him. But I would say that RC is for stateless person and not a Tibetan citizen. The same RC is issued to stateless of other countries. If you are giving up RC, you are giving up your statelessness, and not Tibetaness. If a refugee parent came to India in 1959 and a piece of land is allotted, the children have the right to inherit — Punjab Basti, MT is an example. But if after citizen of India, now applies for a fresh settlement or free school facility, he or she may not get. In fact RC is temporary residential certificate, and after one gets permanent address called Aadhar card, RC automatically becomes invalid. I wish people read in detail the arguments in the court put up by Mrs Subramaniyam Swamy during the passport case of Ms Namgyal. On the issue of Citizenship of India, the debate thus far has only been on Article 3 – birth right. Every Tibetan in India could use Article 5 – Citizenship by Registration – and still be eligible for Indian citizenship. The court also said, “The holding of an identity certificate, or the Petitioner declaring, in her application for such certificate, that she is a Tibetan national, cannot in the circumstances constitute valid grounds to refuse her a passport.” To date, all Tibetans who are considered stateless are provided with a travel document called the Identity Certificate by the Indian Government.